Ground hugging, good thick coverage, stays compact for longer than inferior varieties, grows 15cm high by 90cm wide. Full shade to part sun. Full Winter sun is ok, but protection from Summer sun is a must. Protect from frosts. 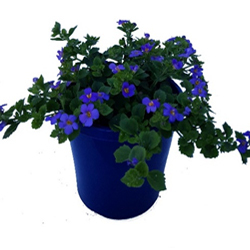 FLOWERING: Elite Violet will flower all year but the best flowering period is during the cooler weather. Unlike inferior varieties Elite Bacopas hold their flowers during wet weather. The flowers are plentiful, smothering the foliage. USES: Wherever you need long term colour in the dreary Winter months and into Spring. During our trials Elite Bacopas flowered for more than twice as long as any other varieties, while remaining compact and not getting "leggy". They are perfect for perennial borders and under planting of standard plants where they will stay squat and colourful. Ideal in mixed containers with other Elite range plants. CARE: Use hedge shears to prune to shape occasionally when required, or they look tatty, this will quickly encourage a bushier plant and repeat flower. They will perform better and flower more profusely with average garden watering and a fertilize every season with an all-purpose organic fertilizer or after a prune. Protect from harsh Summer sun and frost. HABIT: Ground hugging, good thick coverage, stays compact for longer than inferior varieties, grows 15cm high by 90cm wide. FLOWERING: Elite White will flower all year but the best flowering period is during the cooler weather. The flowers are small but plentiful, smothering the foliage in clear white flowers. As old flowers dye off, more and more open all over, they even hold their flowers during wet weather. 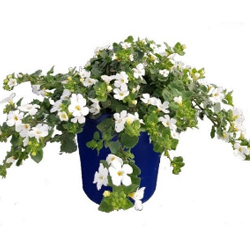 USES: Perfect for pots, hanging baskets, rockeries and ferneries. During our trials all the Elite Bacopas flowered for more than twice as long as any other varieties, while remaining compact and not getting "leggy". They are perfect for perennial borders and under planting of standard plants where they will stay squat and colourful. FLOWERING: Elite Pink will flower all year but will be covered in flower from centre to tip of stem during the colder months. The flowers are soft pink which hold their colour really well. Flowers won't drop during heavy rain. 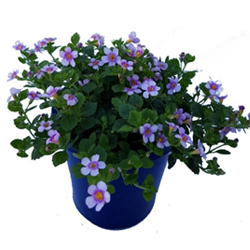 USES: This Elite Pink Bacopa will not disappoint for Winter colour and will go right into Spring. During our trials Elite Bacopas flowered for more than twice as long as any other varieties, while remaining compact with deep green foliage and not getting "leggy". They are perfect for perennial borders, rockeries, baskets, pots and under planting of standard plants where they will stay squat and colourful. Ideal in mixed containers with other Elite range plants. HABIT: Low shrub, good thick coverage, stays compact for longer than inferior varieties, grows 30cm high by 50cm wide. POSITION: Full shade to part sun. Full Winter sun is ok, but protection from Summer sun is a must. Protect from frosts. FLOWERING: Elite Bacopas will flower all year but the best flowering period is during the cooler weather. Unlike inferior varieties Elite Bacopas hold their flowers during wet weather. 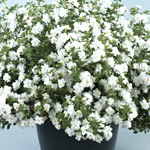 The flowers are a plentiful, smothering the foliage with double pure white blooms. Use hedge shears to prune to shape occasionally when required, or they look tatty, this will quickly encourage a bushier plant and repeat flower. They will perform better and flower more profusely with average garden watering and a fertilize every season with an all-purpose organic fertilizer or after a prune. Protect from harsh Summer sun and frost. FLOWERING: Elite Pink Snowball has spectacular soft pink double flowers that will cover the plant for all of winter but they will not flower for quite as long as the other Bacopas in the Elite range. 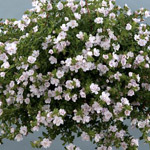 USES: Elite Pink Snowball is a wonderful feature plant for a special hanging basket or on the edge of a retaining wall/ rockery as they have more of a mounding habit and won't hang over too much. They make a great soft plant for around the base of any tall plants. CARE: Use hedge shears to prune into a dome shape once flowering has finished, this will quickly encourage a bushier plant and repeat flowers. They will perform better and flower more profusely with average garden watering and a fertilize every season with an all-purpose organic fertilizer or after a prune. Protect from harsh Summer sun and frost.